We have teachers that we know in person, we have teachers that are from the past and we have teachers from the present that have formed us without direct physicality. I have been fortunate to have many great teachers. Still, what about those teachers, which have impacted our art without us realizing it? I believe artist Ken Auster has been one of those teachers for me. My first experience of Ken Auster’s paintings was in Carmel, California in the mid 90’s. I knew right from the beginning that he was special. I was immediately attracted to his subject matter, his use of neutrals and ability to sculpt with paint. His work was fresh, original, full of life and dynamic. I never meant to be like him or paint like him, but found myself subconsciously being influenced by him, especially in his subject matter. I love painting cityscapes and interiors. Though, I haven’t painted with the impasto he is known for, I am pushing myself towards that direction. My painting above, “In Memory of Ken Auster” just happened. 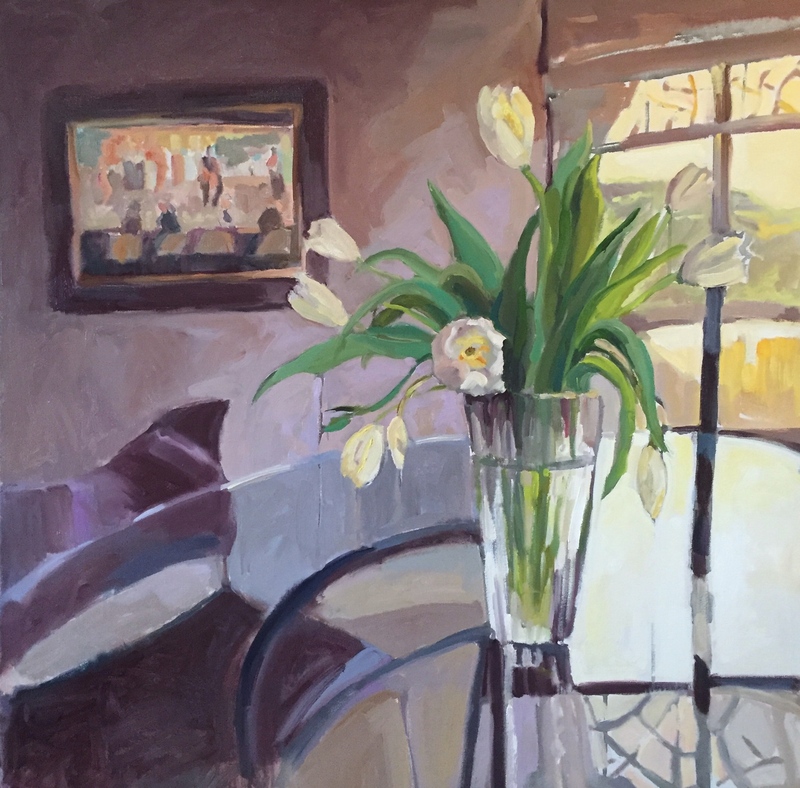 I found myself at the kitchen table one morning noticing the white tulips, Ken Auster’s painting, “I Think They Heard What You Said” (title alone expresses Ken’s great sense of humor) and the sun’s reflection inspiring me to bring this painting to life. Two things out of the norm proceeded to happen; the painting is primarily neutrals and it is a still life, both of which I rarely do. It seemed appropriate to use his beloved neutrals, the opportunity to have his painting remembered in the background and perhaps a reflection of my deep respect for him. His passing was way too soon. Ken Auster will be remembered always as one of the greatest American Contemporary painters. I am fortunate to have met him and have his art in my home. They are having a Celebration of Life Memorial for Ken Auster today, donations in lieu of flowers are requested for Ken Auster’s Membership Fund for the Orange County School of the Arts; Visual Arts Conservatory. If you would like to purchase this painting please contact me at jvander51@msn.com or call (408)460-7237 Thank you! What a wonderful representation of light reflecting life! Beautiful ….. If I were rich, I would be a major collector of your work! Exceptional and the restrained palette is very dignified.